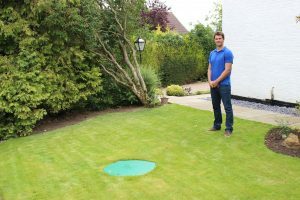 Alastair Lovell from Calor gas explains how rural renovators can make the most of their outdoor areas by choosing an underground LPG tank to store their heating fuel. Rural renovation means creating a new home in a countryside setting, and allows you to enjoy an outdoor space which you may not have access to in an urban location. However, you may feel that the idyllic setting comes with a price if there is no access to mains gas – often meaning a large oil tank taking up space and spoiling the aesthetics of your garden. But there is another option that means you don’t have to sacrifice your outdoor living area – in the form of LPG. An underground LPG tank can be buried and hidden from view – the only thing that is visible in your garden is a green cover that provides access for a delivery driver for when it’s time to refill your tank. By selecting LPG, you also don’t have to compromise on convenience or versatility, as it is just like having mains gas, and is perfectly suited to heating and hot water, as well as cookers, gas fires and tumble dryers. What’s more, you can rest assured that you won’t fall victim to fuel theft, which is common in rural areas as unsightly oil tanks are relatively easy to identify, pierce, and siphon oil from. In contrast, LPG is virtually impossible to steal, and as the tanks can be buried underground, it leaves more space for you to enjoy your outdoor living space. [youtube https://www.youtube.com/watch?v=uc8e1L1fUyU] For former England rugby and Leicester Tigers star, Louis Deacon, moving to the countryside was the chance to get away from the stresses of town life. It was also the perfect opportunity to look at alternatives for heating his new home, which was fuelled by an old oil system. After learning about LPG and the benefits it offers rural homeowners, Louis spoke with his local heating installer, who advised Calor LPG would be a suitable fuel for his property. “We just wanted to feel like we were on mains gas – it was a very simple decision in the end for us”, said Louis. “One of the Calor representatives came out and we looked at different options of where we could place the tank. In the end we went for an underground tank which is great as it doesn’t spoil our lovely garden. “We were also able to have the boiler in the house, where as before our old oil boiler was situated in an outbuilding which wasn’t ideal. We now have easy access and the boiler and controls are really simple to use – it’s just like being on mains gas. “With the telemetry system we don’t need to worry about reordering gas. As soon as the levels get low a delivery is automatically scheduled. Calor are currently offering installation of an underground tank and gas connection for only £1500. For more information on switching your fuel or provider to Calor gas and to find out more about their gas installation offer, visit www.calor.co.uk or call 0800 181 4523.